A quick note about my last post: it wasn’t made clear that the author theory is an interpretative angle amongst others, one I particularly like, but it’s certainly not exclusive. So, for my analysis of Steven Spielberg’s cinema that follows, which will be divided in two or three parts, I’m only using scenes, motives or images that are most relevant for him as an author, but it’s not to say that it’s all there is. His cinema is a tapestry with multiple intertwining threads, like it was once said about Hitchcock, and the closer we look, the better we see the subtleties and the complexity of his work. I’m trying to describe the main picture as I see it, following with my words his leading thread, but whole other subtexts are just waiting to be revealed underneath. Steven Spielberg lost the respect he once had: at first, he was celebrated as a young genius, a virtuoso with an undeniable cinematic flair, but now we talk of him with a whiff of suspicion, mainly because he’s often depicted as the prime architect of the blockbusters, this so-called plague of modern cinema. For his detractors, Jaws’ massive box-office success in 1975 signaled the end of a New Hollywood apparently bursting with creativity, this haven of artistic freedom slowly disappearing under the pressure of a newfound interest for monetary gain, until soulless teenage flicks reigned over the patently commercial Hollywood of today. This, maybe, we could forgive, after all Spielberg didn’t intend to make the first blockbuster in cinema history; however, he also shaped our conception of escapist entertainment by popularizing a form of grandiloquent and boisterous spectacle, movies so obsessed with their own artifices that they get lost inside their technological prowess, without a thought about a reality they try to evacuate – at least, that’s what we say about him, but do these reproaches hold up? Well, they do sometimes for certain scenes in some of his movies, but that would be quite a superficial outlook on an exceptional author trying to introduce the notion of responsibility in these infantile blockbusters he supposedly gave birth to. It may well be the most masterful and visually stunning moment of a career full of virtuosic set-pieces, but still, the ending of Close Encounters of the Third Kind (CEot3K for short, 1977) crystallize everything we can criticize about Spielberg’s cinema: a triumphant escape from reality through artifice. The first time we see the main character, Roy Neary (Richard Dreyfuss), in a long shot with a fixed camera, he stands in the foreground, playing with a miniature train, while in the background his youngest son is trying to catch his attention by hitting continuously on his cradle with his doll. In vain: his father turns his back on him, Neary clearly prefers his toys to his family. After his first encounter with moving lights in the sky, this indifference only gets worse, as Neary begins to lose all sense of reality by entertaining his extra-terrestrial obsessions. We can understand why he wants to distance himself from his family life though: Spielberg represents a dreary and dull suburban life invaded by publicity logos (this is true for many of his movies, especially in the 70’s, with these numerous references to brand names in Sugarland Express and CEot3K), and Neary’s family is shown as dysfunctional. During about the first two-third of the movie, Spielberg maintains a superb tension between Neary’s desire to flee what he considers as an oppressive day to day life and the importance of staying near his family that undoubtedly needs an attentive father – but as soon as his wife leaves him, his family seems insignificant, and the movie never comes back to them, they just disappear, as if Neary’s neglectful attitude was trivial and without consequences. In the final act, Neary can finally flee reality: he’s so seduced by an extraordinary spectacle of light and sound that he decides to abandon all his earthly responsibilities in favor of them, an apt allegory of escapist entertainment if I ever saw one. To some extent, Spielberg contrasts Neary’s actions with those of Jillian Guiler (Melinda Dillon’s character), a mother who is trying to get her son back, but in certain scenes she seems more interested in those lights than by her son. And anyway, when Neary steps into the spaceship at the end, his departure is celebratory, nobody questions him or tries to hold him off. Spielberg’s mise en scène is quite clear: why try to improve a bleak reality when you can just take off for a better world? Absent or irresponsible father is the central motif of Spielberg’s cinema, but before CEof3K, these fathers had to learn their responsibilities one way or another, they weren’t allowed to leave their families behind. In Duel (1971), although it’s more ambiguous, the main character also look as if he’s fleeing his family: we know his wife is angry at him for not defending her against a friend, who made a pass at her in a party, but we don’t know exactly how the husband feels about this incident. We do get the impression though that his business trip may also be a temporary escape for him, and not coincidentally, much of the radio he listens to talks about male weaknesses. 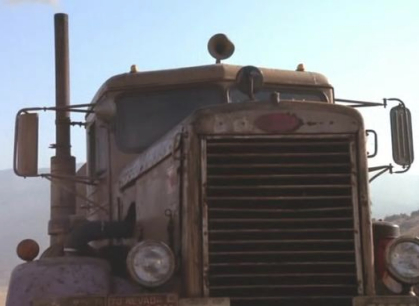 The film, then, can be interpreted as a male protagonist trying to conquer back his virility, represented by an anonymous truck, and he can only come back to his family when he has retrieved his manhood. Or maybe he’s punished for leaving his family when he should try to talk with his wife (he’s dodging their conversation more than anything else), but whichever interpretation you prefer, it’s still the story of a father having to deal with his fear about having a family. Jaws offers a different kind of irresponsible father, given that Brody (Roy Scheider) is a good father for his family, but fails as a father for his community: when he’s watching the beach after the first shark attack, it takes a short moment of distraction for a kid to get kill (the editing clearly emphasizes Brody’s responsibility in this incident, or rather that he feels guilty, as he will states later, and it’s no coincidence that Spielberg decides that this victim should be a young boy instead of an adult). More importantly, Jaws lightly touches for the first time one of Spielberg’s favorite theme: the relation between a reality and his image, or how an image can either hide a reality or help to see it. In Sugarland Express, the medias already were an important presence but Spielberg doesn’t do much with it, apart from offering a contrast between how the journalists look at the two protagonists and how Spielberg’s own movie represents them (there’s a short scene where the characters are disappointed by how they look in the newspapers, saying that their images do not reflect who they are, but that’s about all). In Jaws, though, the movie’s central conflict between Brody and the mayor revolves around the importance of images: the small community of Amity thrives on tourism, so the murderous shark mustn’t be publicized. The mayor tries to protect the calm and attractive image of his city, and through Brody and the consequences of the mayor’s decisions, the movie quite explicitly condemn this attitude of camouflaging an awful reality (the shark) with a pretty image (the panel announcing the city of Amity is prominent in a couple of shots). Again, we are here at the opposite of CEot3K: reality must be dealt with, not hidden. So why did Spielberg change his discourse, turning it on his head, in CEot3K? I don’t know, but from that point on and until the 90’s, his aesthetic became highly artificial, as if the filmmaker took off for the sky with his character, Roy Neary (Spielberg often said that Dreyfuss was his alter ego): Duel, Sugarland Express and Jaws were quite close, aesthetically, to the New Hollywood, they were grounded in a coarse image of America, in a day to day life of the average American, but after CEot3K his movies are closing in on themselves, with 1941 (1979) irresponsible extravaganza, which begins on a self-referential scene, a parody of Jaws, or with the artificial decors of E.T. (1982), or the Indiana Jones (1981, 1984, 1989) robbing, like good archeologists, the adventure movies of classical cinema, reshaping them into a new form without any ties with reality, presenting a dematerialized violence that is used purely for the aesthetic pleasure, or with this The Color Purple (1985) representing an atrocious violence through colorful and pretty images trying to soften the horror. Parenthesis aside, there are a lot of nuances to be made about his movies from the 80’s: in The Color Purple, for example, the artificial look is espousing the perspective of the main character (Whoopie Goldberg), who tries to distance herself from her husband’s violence by perceiving it in a burlesque mode, especially in the second half of the movie, but we are still under the impression that Spielberg is more interested in finding original ways to represents the violence than by the actual human drama (and it’s also a form of escape through fiction, a denial of reality that is rather timidly criticize by the movie). And in the Indiana Jones, the idea of parenthood is gradually introduced, first by making Jones a substitute father to Short Round in Temple of Doom, and then with Sean Connery as the absent father who has to get reunited with his son in the Last Crusade (and in the fourth one, Jones will get to have an actual son). Each time, like he will do with much more confidence later, Spielberg uses these father-son relationships to nuance his spectacle, by having these fathers educate their sons in how to look (or not) at the violence in front of them. In the Last Crusade, for example, Jones’ father is quite astonished by his son’s ability to kill, which he learned mainly because his father wasn’t there for him, like the first sequence with the young Indy implies (here it’s played for laughs, but a similar scene occurs more dramatically in War of the Worlds). 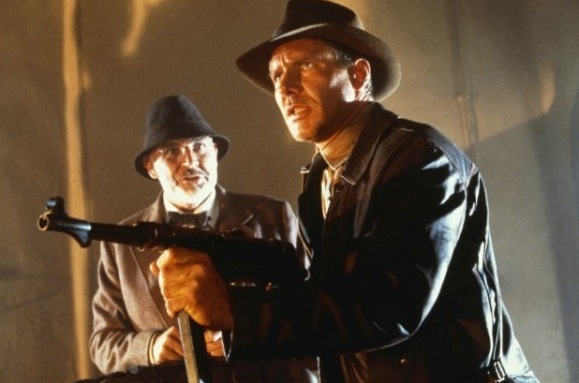 It’s no coincidence that Last Crusade is the least violent film of the original trilogy, since it’s where father and son are reunited; in Spielberg’s cinema, a responsible spectacle is possible only if the characters, usually the fathers but sometimes the sons, are willing to learn their responsibilities (an idea subtly presented for now, but it will get quasi-explicit in his later films). In E.T., his best movie from the 80’s and, apart from a small detail at the end, by far his most “responsible” film of that period, it’s the son, Elliot, who has to grow up by himself: a bit like The Color Purple, in E.T. the artificial look of the suburbs serves to emphasize that the movie is meant to be a theater of Elliot’s conscience. Elliot has to deal with his parents’ divorce, and learning to leave his space friend is an obvious metaphor for the acceptance of his father’s absence, but more deeply, through E.T. Elliot gains access to the adult world. With the exception of Elliot’s mother, we never fully see the adults before the last act, Spielberg only shows their legs, and he uses mostly low-angle shots to imitates a kid’s perspective: Elliot accepts his mother in his world, but the rest is out of reach, his world is confined. Without going too deep into the psychoanalytical angle (ever notice how E.T. looks like an excrement? ), Elliot (or rather E.llio.T.) must separate from his friend (or father substitute) in order to earn his place in the world. The first grown-up we see is a scientific shouting “They’re separating!”, then Spielberg uses several close shots of doctors, as the adults are finally allowed to enter the movie, i.e. Elliot’s conscience. The religious reading of E.T. is well-known: the creature from space stands as a modern Jesus descending on Earth, doing miracles with his luminous finger, dying, resurrecting and transmitting his message of love through his apostle Elliot before going back in the sky. The adults live in a corrupted world, with their pollution (the hunters at the beginning are first introduced with their car blowing out smoke just after E.T. was carefully observing the plants in the forest) and their violence (the police try to stop the kids with guns! ), so Elliot learns through E.T. not only to enter this flawed adult world, but also how to change it for the better. Again, we are here at the opposite of CEot3K, E.T. (the artifice, a metaphor inside Elliot’s mind, or the movie itself) serves to get access to reality or as a gateway to a better world. In other words, Spielberg is celebrating classical cinema: in a famous scene, John Ford’s The Quiet Man influences the actions of Elliot/E.T. who reconstitutes a scene playing on television; for Spielberg, images can shape reality, and movies are a powerful tool, capable of producing some of the most transformative images. 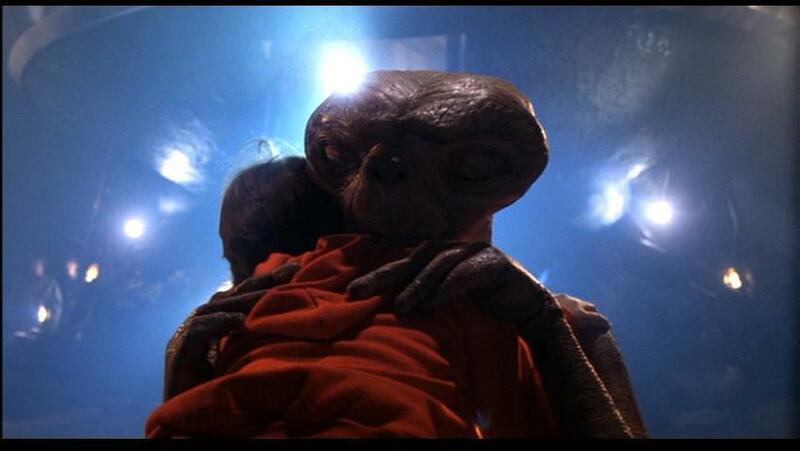 The problem with E.T., though, is in the last scene, when E.T. goes back in his spaceship: only Elliot and his family are allowed to see him go, which undermines the preaching about universal love the movie wants to make. We feel as if E.T. merely helped Elliot reconstitute his family, with Peter Coyote’s character standing as a new father; the presence of other witnesses would have open the movie beyond the personal drama of the main characters (although, if memory serves me right, Spielberg somewhat corrected this later, with the special edition DVD, on which he added one shot where we see Elliot’s friends). Spielberg can be damn frustrating when you try to follow him: unlike other authors, there is no clear trajectory in his oeuvre, as he sometimes seems to go in one direction for one or two movies, only to regress one movie later, before correcting his course again in a new way. Someone like Clint Eastwood, on the contrary, went on a straight path from Dirty Harry to Gran Torino, his thoughts evolved in a clear direction movie after movie. However, both him and Spielberg work in a similar self-reflexive manner, with movies revolving around a series of motifs, repeating certain scenes and situations to give them each time a new meaning – and this is what we will see next time, how the last scene of Always (1989), for example, corrects the ending of CEot3K, or how Jurassic Park (1993) is one of the most poignant self-critic a filmmaker has ever done, or how War of the Worlds (2005) is the logical conclusion of Spielberg’s career, a masterful summary of all his ideas wrapped in his most “responsible” spectacle that also stands as a treatise in how to look at the horror.